We've seen iPhones in blenders, aerial balloons and underwater, but this may be the first time someone has launched an iPhone into space. At the Baikonur Cosmodrome in Kazakhstan, NASA astronaut Scott Kelly and Russian cosmonauts Oleg Skripochka and Alexander Kaleri made final preparations for their launch Thursday aboard the Soyuz TMA-01M spacecraft to the International Space Station. Their two-day journey to the station will begin with a launch set for 7:10 p.m. EDT. NASA TV coverage of the launch will begin at 6:15 p.m.
Kelly, Skripochka and Kaleri are scheduled to dock to the station’s Poisk module Saturday at 8:02 p.m. completing the Expedition 25 crew. Welcoming them aboard will be current station residents, Expedition 25 Commander Doug Wheelock and Flight Engineers Fyodor Yurchikhin and Shannon Walker. 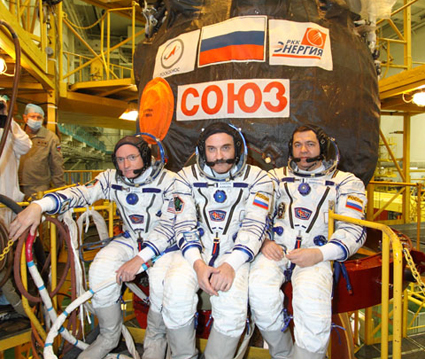 Wheelock, Yurchikhin and Walker arrived June 17 aboard their Soyuz TMA-19 spacecraft. Live HD coverage at SpaceVidCast. Live video at SFN. Discussion at Nasaspaceflight. Preflight pics are up at JSC and Energia. Rollout vid at YouTube. More clips at Space Multimedia. Check the links at right for play-by-play and NASA TV.